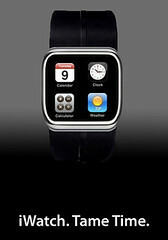 MyCase Blog Home » iWatch: The Future of iPractice? Rumors abound. Apple may be in the process of creating an iWatch–a watch-like smart phone with a flexible screen that has been described as the next step toward wearable, always with you technology. Whether it’s Google Goggles or the iWatch, it seems undeniable that we’re moving toward an always-connected culture–and we’re headed there quickly. Which is great. But so what? If the iWatch becomes reality, will it have a direct effect on the delivery of legal services? Will it single handedly change the way that lawyers practice law? Probably not. But the very real possibility that wearable technology is in our near future is simply further evidence that the times they are a-changin’–and they’re changing fast. And these new technologies are affecting–and being embraced–by every generation of legal consumers, from the Baby Boomers on down. For example, as Kevin O’Keefe recently reported at Real Lawyers Have Blogs, although adults 60 years and over tend to prefer reading from pages on physical books, they are actually able to read more efficiently using digital readers. Based on that information, Kevin suggested that law firm content should be digitized since older law firm clients find it easier to read digital content. The older readers generally spent nearly 3 seconds more reading paper and over 4 seconds more reading on an e-reader than they did a tablet. That means that potentially lawyers can read more and presumably read better when using a tablet instead of paper. And when you attach a time savings and demonstrate efficiencies to decision-makers in law firms, you just might be able to convince them all that they should invest in the technology to go digital. So, this particular advancement–the ability to easily and inexpensively digitize content and how doing so benefits lawyers and legal consumers of all ages–is just one example of how new technologies can affect the delivery of legal information and legal services. Two aspects of disruptive technology theory are noteworthy. First, as the Kodak example illustrates, disruptive technologies can help to unseat and bring about the demise even of market leaders. Second, in the early days of disruptive technologies, market leaders as well as their customers often dismiss the new systems as superficial and unlikely to take off. Later, however, they gain acceptance, customers often switch quickly to services based on the new technology, whereas providers, unless they are early adopters, are often too late to recognize their real potential and never manage to regain ground. That the legal field is slow to adapt to and take advantage of the recent technological revolution is not a new claim. Study after study has borne out this conclusion, most recently, as noted at the Cordell Parvin blog, in a study out of Georgetown Law Center for the Study of the Legal Profession, the 2013 Report on the State of the Legal Market. The legal market today is an increasingly difficult and challenging environment, one that calls for clear thinking, strategic focus, and flexibility in addressing rapidly changing realities. To an unfortunate extent, however, many lawyers and law firms seem stuck in old models–traditional ways of thinking about law firm economics and structure, legal work processes, talent management,and client relationships–that are no longer well suited to the market environment in which they compete. Inspired in part by the AppleStore concept, LegalForce makes the law user friendly just as Apple has made technology user-friendly for the past decades. The LegalForce store functions as the physical hub for a variety of law-related services for consumers and small businesses, offering law and business books, tablets loaded with law resources and access to computer-based forms. After all, many times consumers may not need a lawyer at all. So, change in the delivery of legal services is clearly afoot. That this rapid change is occurring is undisputed. That it’s changing the way that our culture communicates, interacts, and conducts business is likewise indisputable. For proof, look no further than Oreo’s wildly successful Super Bowl ad–arguably the most talked about of all Super Bowl ads–created spur of the moment during the power outage and which immediately went viral via social media. It’s a different world now. Just 5 years ago, the Oreo ad would have been unthinkable. And that’s the problem–the rate of change is so drastic that it’s difficult to wrap one’s mind around it, let alone predict where it will lead. That the legal field will be affected is a given, but what the law firm of tomorrow will look like anyone’s guess. Astute lawyers will at least be thinking about the possibilities and that’s what’s important. Because that forward-thinking, open-minded mindset is what will ultimately be the difference between swimming and sinking in the emerging legal landscape.